Arkansas – “The Natural State” – Beating the Fitness Crisis in America one Push, one Community at a Time! The tragedy of life does not lie in not reaching your goals, the tragedy lies in not having any goals to reach. It isn’t a calamity to die with dreams unfulfilled, but it is a calamity not to dream. During my down time, I like to read the news and see what interesting articles I can find about proper fitness and nutrition. Well today I was doing just that and came across something that I found very interesting especially in a world where people think everything can be solved my taking medicine. The number of children diagnosed with a spectrum disorder has increased dramatically in the last decade. Spectrum disorders include attention deficit disorder (ADD), attention deficit hyperactivity disorder (ADHD), Asperger’s syndrome and autism. The severity of these disorders can range from a child who has difficulty concentrating in school to one who cannot communicate at all. In this column, we would like to focus on ADD/ADHD. Many people wonder why the incidence of ADD/ADHD is increasing so dramatically. There are varying explanations, some of which are commonly understood and others which are controversial. One thing we do know is that schools are much more focused on diagnosing children who have ADD/ADHD. Years ago, these children were often simply considered “unruly.” Changes in diet over many years, with a shift to greater consumption of hydrogenated fat and refined sugar, is believed to have also played a role in this surge. Another possible cause that has been highly debated is the measles/mumps/rubella vaccine. A higher incidence has been linked to children who have had the vaccine, but the research methods that have led to this conclusion have been called into question. One thing they say in the article I read that especially caught my eye not only about our – BIG PUSH – across America to bring attention to the importance of bringing attention to the importance in taking part in regular fitness activities, sport and tips on how to make healthier choices for nutritionally balanced meals and healthy snacks. 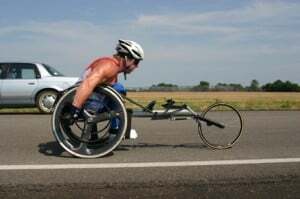 Also for the – Fitness 4 All 50 State Tour – a nonprofit 501 (c )(3) which will follow our – BIG PUSH – and our plan to start the – Fitness 4 All 50 State Tour – is tentatively scheduled for the Fall School year of 2012 to visit around 4,000 schools 3 -12 nationwide and giving presentations on proper Fitness and Nutrition and why the importance of getting the best information possible to the students, parents, teachers and school districts. We will also be holding – Health & Fitness Summits – for each city Mayor, council members and community leaders which would be close to 4,000 Health& Fitness Summits I will give as well. We will also present one to every Governor, staff and state leaders in all 50 states as well. I will use my skills that helped me become one of the tops motivational speakers in America. 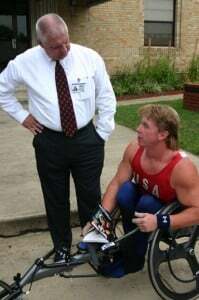 I am also an inspirational speaker, motivational coach and I given over 5,000 presentations over a thousand to schools I have spoken to across America about the importance of fitness as a fitness speaker, educational speaker, university and college speaker/ I also speak to associations, nonprofit groups and organizations about reaching and surpassing their goals and overcoming adversity. Also I get many requests as a safety speaker as I was injured shortly after college in one of the worst grain elevator explosions of its kind in U.S. and Texas history. Like I mentioned because of our – BIG PUSH- promoting proper fitness and Nutritional one community at a time it caught my eye to see this article that talks about how it is essential when treating ADD/ADHD is to get nutrition and digestion in order. The wrong foods, those that are highly complex, fatty and sweet, are harder for the body to digest and can alter the natural balance among the neurotransmitters which regulate behavior. Many children in the spectrum have a digestive imbalance. This leads to craving a simple carbohydrate (white sugar and flour) which is very disruptive to one’s health. By correcting the digestive imbalance, the cravings for these bad foods diminishes, and the ability to digest more complex beneficial foods such as fish, complex carbohydrates and healthy fats improves. The body has excitatory and calming neurotransmitters. Children with ADD/ADHD have an imbalance, with too many excitatory neurotransmitters and not enough calming nerotransmitters. This means children get too excited, lose their focus, and then “melt down” as they cannot gradually calm down. Most insurance plans will cover neurotransmitter evaluation, which involves a simple urine test. The results of the test can help point treatment in the right direction. With the proper nutrition, neurotransmitter balance can often be restored. Children who cannot adhere to the right diet can take supplements, such as fish oil supplements, which are available in many pleasant-tasting forms and can even be blended into a smoothie. There are also herbal supplements that can be helpful. Rhodiola, for instance, is an adaptogenic herb, which helps to fight stress in the body. What I read said, this herb can have the same effect as a medication used to treat anxiety and stress, but without the negative side effects. Like most other medical conditions, stress can exacerbate ADD/ADHD as it robs children of the rest and sleep time that help to restore the body’s natural balance. People often ask us about medication to treat ADD/ADHD. There is an analogy that we often use to explain how we believe medication should be used. Think about a house with a deteriorating foundation. To properly fix the foundation, the house has to be supported with beams while the foundation is repaired. The medications are just like those support beams, temporarily providing neurotransmitter balance while proper nutrition and the related proper digestive and bowel function is restored. Again, I urge anyone who is starting a new exercise program to see your personal Physician before taking any action. According to this article, the medications can work well in the short term but can pose issues over the long term. They can exacerbate problems with sleeping, which is difficult because rest is such an important part of the equation. In essence, they enable children to tread water by keeping the negative effects of ADD/ADHD in check, but often they never fully restore the delicate neurotransmitter balance in the body. Every case is different of course, and in each instance the medical team treating a patient should determine the best course of therapy. What I can say is that every case is different can also apply in some cases to each individuals needs for Fluid intake, nutritionally balanced meals and types of healthy snacks, amount of rest you need depending on your bodies needs. Also whatever your goals and dreams are and how committed, determined and how far you are willing to push yourself out of your comfort zone to reach them. Here is a simple example in the next paragraph of this. Example: For instance Lance Armstrong the 7 time winner of the Tour De France is the Most Famous Bicycle Race in the World and is one grueling and challenging bike races in the world as well. It’s also the world’s largest annual spectator event with millions of people lining the route to see the peloton (the large group of bike racing leaders) go by. 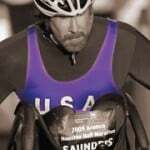 You can see on Lances site at this link http://www.livestrong.com/dares/ How his Live Strong dares you to change your lifestyle now and keep track of your of your daily food intake, exercise and much more. Lance and other Tour De France riders require about 7000 to 10000 calories per day because of their tremendous work they are required to do in this bike racing sport. The cyclists, like Lance and others require so many calories because the energy incredible energy they expend during the race. The race lasts 21 days and is 3,600 kilometers long or 2,200 miles the race is broken into day-long segments that average 150 – 200 kilometers per day or 93.2 – 321.87 miles, called stages. Individual times to finish each stage are aggregated to determine the overall winner at the end of the race. The rider with the lowest aggregate time at the end of each day wears a yellow jersey. The course changes every year, but the race has always finished in Paris. As you can Lances needs for the Tour De France or in his training to prepare for it would be far more than a person who is just starting a strength and aerobic conditioning program. If your goal is to lose weight then you have to burn more calories than you would consume. This way when you set your long and short term goals and keep track of the food you eat and what time of day and how much you will be able to determine the calories you consumed and also if you keep a record of your aerobic activity and strength conditioning what you did in each case and how long it took and how hard it was. By keeping track of your choices that precisely that allows you to see what is working best for you and what is not over a periods of weeks or months. It also allows you to start eliminating what is not working for you and incorporating more of what does work good for your personal needs. If you’re cheating on your – My Daily Healthy Lifestyle Journal – the only person that really ends up losing in the long run is you! On the – Fitness 4 All 50 State Tour – when we come through your area we want to see you succeed and reach your personal goals for your health, fitness and how you look and feel. So you are more alert and do better in your classes and have more endurance, flexibility and energy this allows you to get your work done and enjoy each day too! We have become accustomed to quick fixes in our society. People are used to taking a pill and making problems go away. Often, however, the solution that takes the hard work, discipline and determination is the better approach. That is the case with ADD/ADHD. It may seem difficult to transition a child to a diet rich with things that a child doesn’t like, such as fish, fruits or vegetables or other healthy choices. It has been our experience, however, that once children see the benefits of this shift, and once they feel more control over how they feel and how they act, they want to maintain the diet. It does not mean that they can’t ever enjoy a treat, but it must be done in moderation. For frequent readers of this column, one theme is clearly dominant: What we put into our bodies is the best indicator of what we get out of them. Our country is dealing with record levels of such illnesses as autism spectrum disorders, diabetes and digestive problems like irritable bowel syndrome and inflammatory bowel disease. We don’t have all of the answers about causes, but we do know that balance in lifestyle and in what we eat is critically important to good health. Proper nutrition, exercise and rest are the three legs of the good health stool. 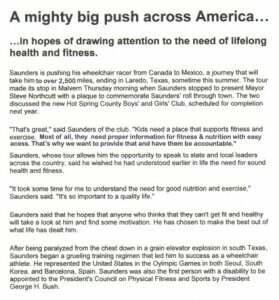 Kevin pushes hard for fitness and to get to Malvern, Arkansas for his Health & Fitness presentation to the Mayor, city and community leaders. 5:00 – Got up to get ready for our – BIG PUSH –to promote fitness and healthy nutrition one community at a time. The – BIG PUSH – the prelude for the – Fitness 4 All 50 State Tour – a nonprofit 501 (C) (3) organization 50 state tour with almost 4,000 presentations given to schools and around 4,000 given as Health & Fitness Summits to city Mayors, councils, community leaders and Governors, state officials and leaders. Our – Fitness 4 All 50 State Tour – organization’s mission is to serve as a catalyst to inspire, motivate and empower our nation’s youth, parent’s teachers and the American people through educational presentations given to between 3,000 to 4,000 schools in all 50 states to help them learn why making healthier lifestyle choices by helping each student develop a vision for their personal fitness activities and sports, making good daily nutritional choices and build internal motivation of those ideas. So they are motivated from within to seek out healthier choices on a daily basis. 7:30 a.m. CST – We departed for Malvern, AR for a meeting with the Mayor and the local newspaper. 8:30 a.m. CST –After a fast push to Malvern, I met with Mayor Northcutt of Malvern as well as Richard Tart, the Police Chief, William F. O’Keefe, the Assistant Chief of Police, and other city leaders where I gave them a presentation from the Health and Fitness Summit. They told us about a new Boys and Girls club that they are planning to open late next year. I told them about the mission of our ‘Big Push’ and ‘Fitness 4 All 50 State Tour’. They were excited to learn that they could gain free access to the website to gain beneficial information and tools. I presented the Mayor with a certificate from the ‘Big Push Across America Tour’ as well as a copy of my book in front of the Malvern City Building. They wished us all the very best. The Mayor told me about how he had seen me on TV the previous morning. 9:00 a.m. CST – We immediately drove to Benton, AR to fix a flat on Andy’s bike at a local bike shop. 9:45 a.m. CST – We met with Benton Sheriff, Phil Mask and the Saline County Chaplin, Doug Burk. Doug received a plaque from the ‘Big Push Across America Tour’ on behalf of the Mayor of Benton. I went over the key points of the Health and Fitness Summit presentation with Doug and Sheriff Mask to relay to the Mayor. I gave them each brochures with information about the ‘Big Push’ and asked them to encourage the Mayor to look at Imshapingup.com, which offers free resources to city officials. These resources enable communities like Benton to create lasting proper health and fitness initiatives and provide easily understood information that everyone can use. With the support of the community and with all citizens working towards a healthier community, the war with obesity can be won one community at a time because “There Is Always A Way Because You Never Give Up!”. They were very receptive of our invitation and both wished me well as I pushed on. They told me that they would make sure that the Mayor received the information. I left Doug Hunt with a copy of my book as well. 11:00 a.m. CST – We drove back to Malvern, AR and finished our push from Malvern to Caddo Valley, a total of 32 miles. 3:30 p.m. CST – We finished our day of pushing. During the day, there had been a few light sprinkles. Later in the afternoon, those sprinkles became a full downpour. While it rained, we made calls to the mayor and the media in Arkadelphia to set up times for meetings tomorrow. We also followed up on contacts in Hope, AR, and other cities we would be traveling through, for meetings with city officials and media in that city. 6:00 p.m. CST – We uploaded pictures and updated the log for the last few days. And we printed out certificates that we would be presenting to the city officials over the next couple of days. 11:00 p.m. CST – Download our pictures gave them captions & wrote our blog for the day we made to bed early by 11 p.m. See you tomorrow on your the road and your road to fitness! Remember that There’s Always a Way to reach your goals and Live Your Dreams when you Never Give Up! on them! With my best!